Enjoyment starts the minute you arrive at Ocean Villas! Upon your arrival, a management representative will greet you and acquaint you with the surroundings and your villa. You can refresh immediately in your spacious infinity pool which seems to spread beyond its rim to the endless ocean. If you wish to exercise in the extensive lap pool which is directly under your raised, first floor balcony, you can be assured that the heated spa is waiting afterwards for your relaxation. 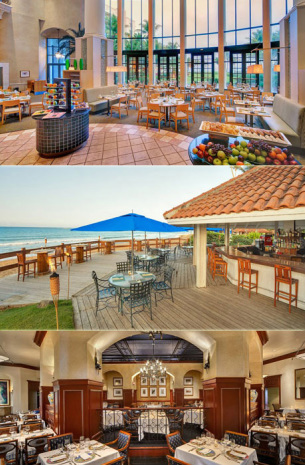 On the days when you don't feel like fixing a meal in your own kitchen, there are many options for breakfast, lunch and dinner that are a stone's throw away from the Ocean Villas. Marbella - an international, casual and family friendly restaurant - is available for breakfast, lunch and dinner, Marbella serves both traditional American fare and Puerto Rican favorites. With its enchanting garden and ocean views, Marbella is as scenic as its food is flavorful. Palio - This award-winning Italian restaurant combines an intimate atmosphere within an elegant setting for an unforgettable experience. Roots Coastal Kitchen - Caribbean Comfort Food Dining serves exquisitely prepared high quality farm to the table style dining, specialty handcrafted cocktails, artisanal ice creams and to go service for lunch and dinner. delectable drinks. Five o'Clock Somewhere - Enjoy a frozen drink, tropical fruity beverage, or favorite wine or beer in the tiki-style bar with live entertainment. Relax at the restaurant or grab your drink and wander over to the nearby fire pit. 5 o’Clock Somewhere Bar & Grill offers refreshing beverages, juicy burgers, and tasty meals amidst fresh ocean air and mesmerizing views. Tiki Bar & Grill - The oceanside Tiki Bar & Grill opens everyday at 11:00 a.m. and is the ideal spot for one to sip tropical beverages garnished with warm sunshine and cool trade winds. Richie's Bar & Restaurant - Sitting atop a hill just five minutes away, is Ritchie's Restaurant which offers unparalleled views of the Caribbean panarama and superb food to match. Club Bahia - Also located inside the Wyndham Rio Mar Beach Resort is Club Bahia, which serves as a player's lounge and casino for those looking to test their luck. All bets are on whether you’re having a drink at the bar, watching one of our 50-inch plasma screens or keeping your eye on that little silver ball. Steps away from the Ocean Villas are two first-class, championship golf courses that provide a magnificent backdrop for the recreational golfer yet can also challenge the more discriminating player. 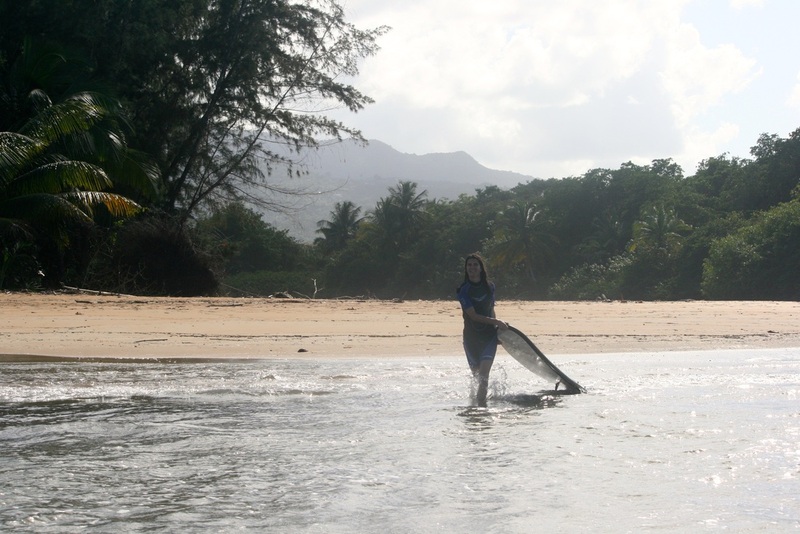 They are maintained beautifully by the staff at the Wyndam Rio Mar Beach Resort. The Ocean Course was designed by Tom and George Fazio and features 6,782 yards of Atlantic panoramas and ocean breezes. 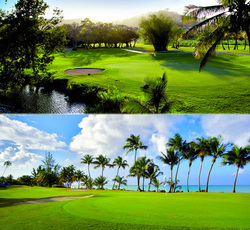 Its signature 16th hole - an oceanside par 3 - always rates among the Caribbean's best. The River Course was Greg Norman's first Caribbean design that winds its way along the Mameyes River. The layout is exquisitely framed by vistas of mountains and seas. It is a layout that is ideal for players of all skill levels as it features wide fairways, open greens, shallow bunkers and light rough. Once you are totally relaxed, think about experiencing more of this beautiful island. Less than ten minutes away is the El Yunque National Forest - a finalist in the New Seven Wonders of Nature competition. Twenty-four miles of clearly marked and well maintained recreational trails are available highlighting waterfalls and swimming holes. 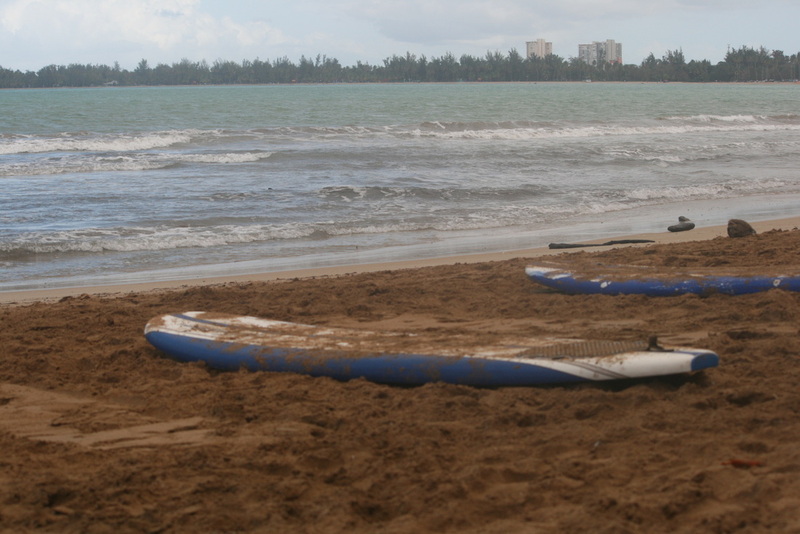 Watersports and rentals are available on site, but in addition, catamaran sailing, leisure and sunset cruising, deep sea fishing, island day trips, surfing, snorkeling and scuba diving are available just twenty minutes away in Fajardo and LaQuilla. There is also professional instructors who are available to show new and seasoned surfers the memorable surf. Don't forget history and shopping also. Forty minutes away you can take a day trip to visit picturesque Old San Juan which highlights centuries old Spanish fortresses, cathedrals and museums. Walk along blue cobblestone streets accentuated by boutiques, clothing stores and art galleries. Stop along the waterfront to watch cruise ships anchor and enjoy the many superb restaurants at every stop. It's fantastic! We have traveled to all parts of the island, so let us know what you want to do and we'll help you organize a trip to remember! "We stayed at this Villa for 8 days. What a great time... If you want to relax, and do nothing, or if you want to go out and about this is the Villa for you.."